Sheriff Craig DuMond is a life-long resident of the Delaware County Town of Masonville. Upon graduating from Sidney High School, he initiated his law enforcement career as a Military Police Officer in the United States Army as was stationed in Germany as well as the States of Alabama and Maryland. After being honorably discharged from military service, Sheriff DuMond returned home and became employed as a Correctional Officer by the NYS Division for Youth as well as a Police Officer for the Village of Walton. Over the next 22 years he ascended through the ranks with NYS DFY, and ultimately served as a Juvenile Correctional Facility Director; all while continuing to serve as a Police Officer for the Village of Walton. In 2006, Sheriff DuMond was elected Supervisor for the Town of Masonville where he also served as a Legislator on the Delaware County Board of Supervisors and Chairman of the Public Safety Committee. In 2012 he was appointed Undersheriff by Sheriff Tom Mills and was became directly responsible for the executive oversight and supervision of the Delaware County Sheriff’s Office to include the Law Enforcement, Criminal investigations, Civil Enforcement and Jail Operation Divisions accordingly. 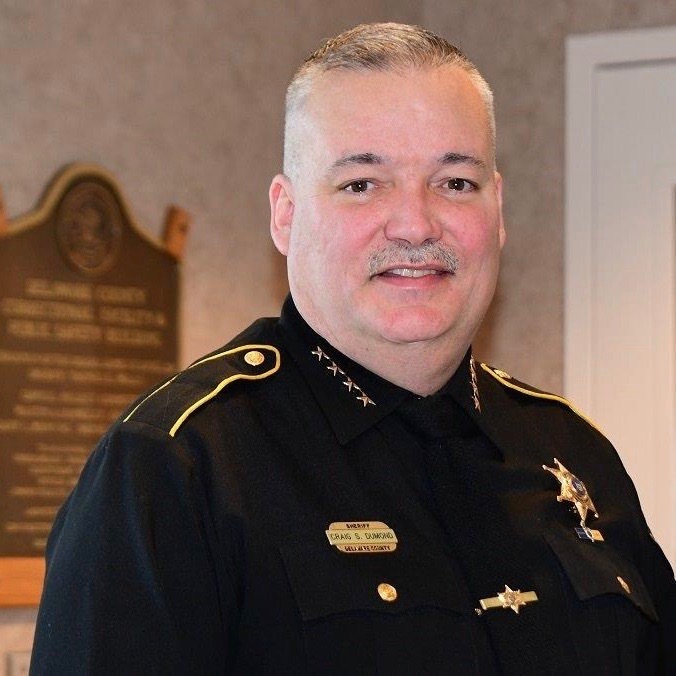 In 2017, he became acting Sheriff and was subsequently elected Sheriff of Delaware County in 2018. During the election, Sheriff DuMond was endorsed by both major political parties; a distinction for which he is proud as he believes the Office of Sheriff should never be politicized. During his tenure at the Sheriff’s Office, Sheriff DuMond has been responsible for the creation of the K9 Division, Mounted Equine Division, School Resource Officer Program and Special Response Team. He is the Chairman of the Delaware County Drug Task Force and an active member of the New York State and National Sheriff’s Associations; serving on various committees in both organizations. Entering his 32nd year in law enforcement, Sheriff DuMond has furthered his education at SUNY Empire State College as well as completed numerous law enforcement and executive-level training programs; to include graduating from the 115th session of the National Sheriff’s Institute Executive Development Program as well as the NYS Governor’s Office of Employee Relations Executive Management Development Program. Further, prior to being elected, Sheriff DuMond was selected to attend the 272nd Session of the Federal Bureau of Investigation National Academy, however, declined the nomination due to his newly assumed duties as Sheriff of Delaware County. Sheriff DuMond and his wife, Karleen, have (4) sons; two serving in the United States Armed Forces and (2) currently attending school.